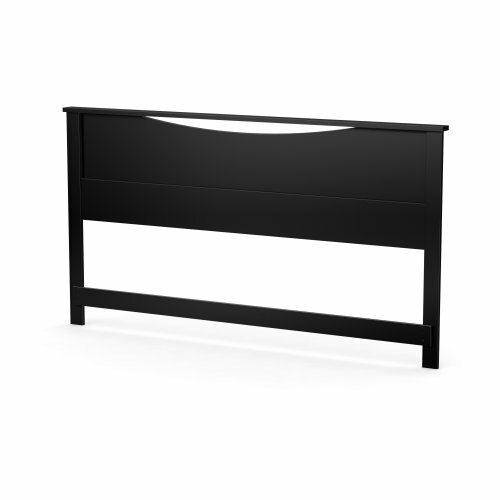 This Step One King Headboard in a Pure Black finish with its geometric lines and European-inspired style will add elegance to the bedroom. Designed to be attached to the Step One platform beds 3107237 or 3070248 for a complete kit, but can also be attached to a standard king (78") metal bed frame. Also available in Pure White or Chocolate finish. Measures 88-1/4-inch wide by 3-inch long by 44-inch high. Delivered in 1 box measuring 94-3/4 in. by 16-1/4 in. by 2-3/4 in. and weighing 60 lbs. The back surface is not laminated. Accessories not included. Manufactured from certified Environmentally Preferred laminated particle panels. Complete assembly required by 2 adults. Tools are not included. 5-year limited warranty. Made in Canada. If you have any questions about this product by South Shore, contact us by completing and submitting the form below. If you are looking for a specif part number, please include it with your message.